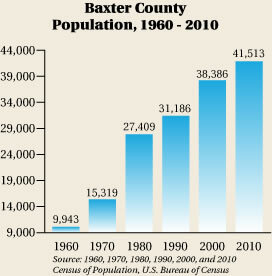 ﻿Because of its pristine natural surroundings and low cost of living, Baxter County has experienced steady, positive growth over the last decade. 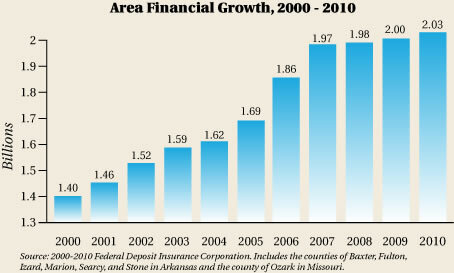 Baxter County serves as the main trade center for North Central Arkansas. Residents from 10 counties - Baxter, Marion, Boone, Fulton, Izard, Searcy, and Stone in Arkansas, and Howell, Ozark, and Taney in Missouri - work, shop, and play in the Mountain Home area. Over 240,000 (as of the 2010 census) live in these ten counties. Other franchises located in Mountain Home include: McDonalds, Sonic, Burger King, GameStop, Taco Bell, Pizza Hut, Arby’s, Domino’s, Wendy’s, KFC, Subway and Dairy Queen. Mountain Home also supports many oriental, Mexican and local family owned restaurants. But perhaps more importantly, the area has seen many new "owner operated" small boutiques and specialty retailers crop up to accommodate the needs of ever-more affluent "urban-minded" residents looking for more unique product offerings and more personalized service. 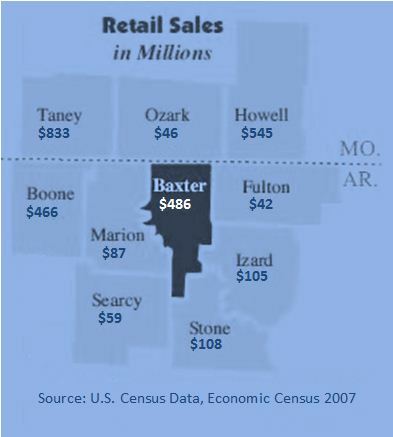 The bottom line is that the individuals and companies opening these retail businesses would not be investing in Mountain Home or Baxter County if they had not done research to assure them that this area is worth their investment! Baxter County enjoys a well-balanced economy. A stable, relatively affluent, active retiree population, recently “discovered” by “baby boomers” from all across the U.S. While different businesses require many different environmental and technical elements for success, Baxter County offers the one resource critical to the success of any business endeavor - an efficient and loyal work force. 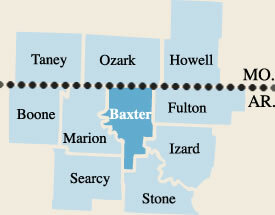 Our area's work force resides within ten counties; in Arkansas these counties are Baxter, Boone, Fulton, Izard, Marion, Searcy and Stone, and the Missouri counties are Howell, Ozark and Taney. Commuting to work is made easy with North Arkansas Transportation Service (NATS) for those commuting to Mountain Home from select surrounding counties. See additional information on the Education page of this website. A larger proportion of jobs in Baxter County are in the service and trade sectors as compared to the state average. Whether by highway, rail, or air - freight and personal transportation services are available to meet the needs of businesses, residents, and travelers to the Twin Lakes area. 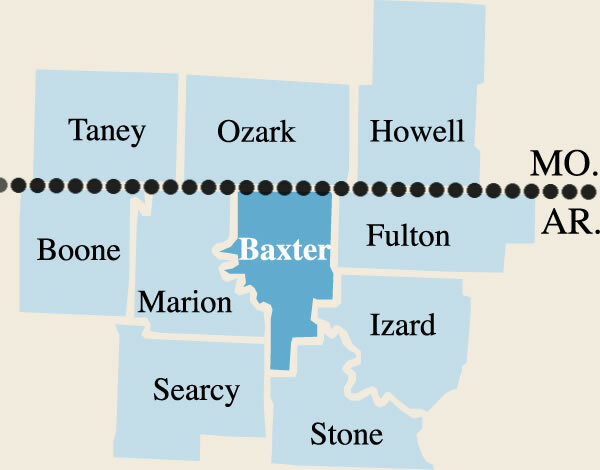 Baxter (and Marion) County is directly linked to a national system of highways. Mountain Home is located on US Hwy. 412/62, a busy east-west highway stretching from western Oklahoma to mid-Tennessee, where it joins I-40. If your destination is north or south, US Highway 65 (Louisiana to northern Iowa) is less than an hour’s drive west, connecting to east-west I-44 in southern Missouri. Mountain Home’s location on US Hwy. 412/62 assures continuing highway improvement as it has a high-priority four-lane designation, receiving passing lanes, widening, and bypasses recently. Ozark Regional Airport (BPK) is four miles northwest of Mountain Home on Arkansas Hwy. 126 N., across from the Baxter County Industrial Park. Ozark Regional airfield provides a 5000 x 75 foot runway with ILS, Localizer/DME, GPS, and VOR approaches. It accommodates aircraft as large as a Gulfstream V.
A 6,800 square-foot terminal building, built in 1993, has airport offices, a restaurant, Civil Air Patrol squadron, and commuter terminal. Travelers will find car rentals, hotel shuttles, and taxi service. Airport services include fuel, parking, hangars, aircraft maintenance, rental, air charters, flight training, and pilot services. Forty-six hangers can house single and light twin engine aircraft. Mountain Home Bus Agency offers service to and from Chicago and points en route. It also offers frequent public and private chartered tours. Mountain Home Taxi Service is available to locations inside and outside the city. North Arkansas Transportation System - NATS - offers a commuter service to industry and workplaces on a continuous, scheduled basis for eight or more riders. Area residents may also pre-arrange with NATS for rides to medical offices, libraries, senior centers, grocery stores, and shopping areas. Numerous long distance motor freight carriers serve Baxter County, as well as moving companies. There is daily pickup and delivery service in Baxter County by local Airborne, Federal Express, US Xpress, and United Parcel Service trucks. UPS has a distribution center in the Baxter County Industrial Park and serves the area with overnight parcel service and hundred-weight service for businesses and manufacturers. Rail shipping is provided by the Missouri and Northern Arkansas Railroad with depots at Cotter and Batesville. Shipping can be arranged by calling the M&NA at 1-800-228- 3580, ext. 230. The M&NA interchanges with Union Pacific, Burlington Northern, and Kansas City Southern. Representative transit times are: one day to Memphis, Kansas City or Dallas; two days to Chicago or Houston; four days to Los Angeles or New York. Passenger train service is available daily between San Antonio and Chicago, and numerous points in between, from the Walnut Ridge AMTRAK station, 100 miles from Mountain Home.